John Hellström won silver medals in two different classes during the Swedsih Championships “SM” in Photography 2018 - Weddings and Reportage categories. Photographers from all over Sweden had submitted digital photographs to the Swedish Championship. The top 10 pictures in each class made the cut into the final print competition. John had the pleasure of bringing seven photographs to the final, where four photographs were included in the top-10 wedding category. Contact portrait and wedding photographer John Hellstrom via email: john(at)hellstrom.com and mobile phone: 0046-(0)733-668600. Follow on Facebook at johnhellstromphoto and Instagram at #johnhellstromphoto for more photographs. The jury judges all photographs without knowing who the photographers are. 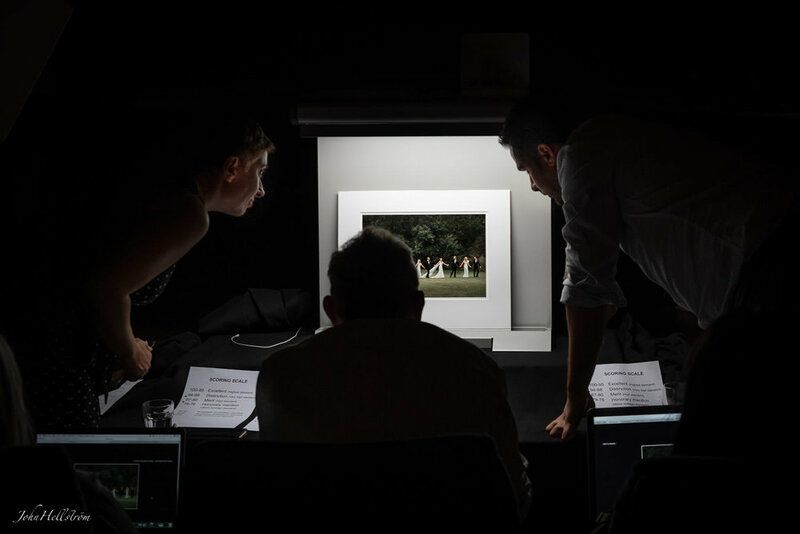 In the final, the pictures are printed and are judged in a lightbox, with audiences all around. If the jury has different points, the chief judge will raise it up to a challenge, where the judges may argue for their case and then make a reassessment. The best top three prints then wins a medal. At the last Swedish Championships in photography in 2017, John won gold in the wedding class. John was after the results in the Swedish Championships selected to the Swedish National Team to represent Sweden in the World Photographic Cup (WPC). The wedding couple with guests walking to the ceremony. A second place winner at the Swedish Championship 2018 wedding category.